Junior co-captain Dante Fabbro has been named a 2019 Hobey Baker Award nominee. 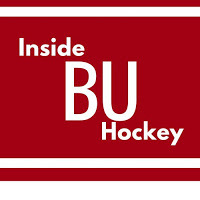 ►This week's episode of Inside BU Hockey features Bernie Corbett's interviews with head coach Albie O'Connell and freshman forward Matthew Quercia. 2019 recruit Trevor Zegras, a projected high first-round pick in the next NHL draft, is profiled by NHL.com. The 6’0” left-shot forward has a friendly competition with his sometimes linemate and likely first overall draft pick Jack Hughes. Zegras is second to Hughes in scoring on the NTDP U18s with 49 points in 34 games. Incredibly shifty and seemingly possible to contain, Wilmer is a crafty yet decisive skater who uses his edges and creativity to his advantage with each passing shift. A threat in the offensive zone owing to his stellar skating, Wilmer can keep his defenders on their toes given his unpredictability and will make his opposition pay dearly if afforded too much time and space to operate. Alex Chiason’s shootout goal was the game-winner in the Oilers’ 3-2 win against Vancouver. Jack Eichel’s dynamic overtime goal gave Buffalo a 4-3 win over Calgary. The Sabres’ captain’s 16th goal and an assist gave him a team-leading 51 points. Evan Rodrigues scored Buffalo’s first goal, his fourth of the year. ►Mike Grier, currently a Devils’ assistant coach, looks back at his playoff years with the Sabres. Brady Tkachuk scored his 11th goal in the Senators’ 5-2 win against Colorado. Nick Bonino scored twice (9th & 10th) in the Predators' 7-2 win against Washington. Terriers begin a home-and-home series with Holy Cross Friday night in Worcester. Puck drop is at 7 p.m. The teams meet again Saturday at Walter Brown Arena at 3 p.m. The Crusaders are playing their first season in Division 1. BU is coming off a sweep of Providence last weekend.